SAP user companies are more and more often opting for cloud computing. This development is obviously not random but rather a result of SAP’s intensive activities concerning IaaS (Infrastructure as a Service), PaaS (Platform as a Service), and SaaS (Software as a Service) over the past few years. Numerous SAP customers are currently focusing on SAP hybrid cloud deployment with several IaaS use cases and public cloud scenarios. The reasons for this development are multifold. Many see a significant cost reduction, others see an opportunity to boost innovation cost-efficiently for either current or future digital transformation projects. It is known that the use of SAP systems always has to be accompanied by comprehensive data management of the application infrastructure. This includes servers, data bases, networks, OS platforms and system management. As it has worked closely with SAP for many years now, NetApp can be seen as kind of a data authority concerning SAP classic (NetWeaver with AnyDB as foundation) as well as SAP Hana and Hana-based applications. Taking this into consideration, it becomes almost obvious why NetApp also offers its solutions and services in public cloud environments of hyperscalers. 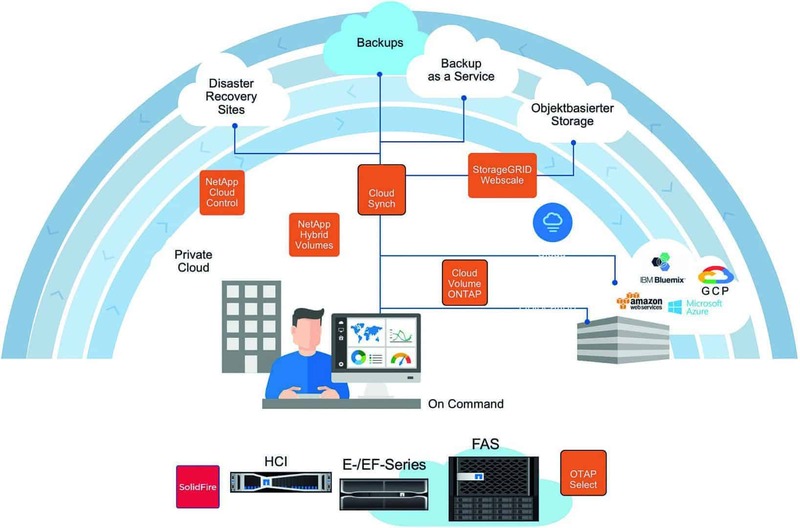 These services include compression, data deduplication, cloning, and integrated data security with high availability, storage-based backup, high end performance and maximized scaling with Clustered Data Ontap and Cloud Volumes Ontap. What is more, in the case of Microsoft Azure, Cloud Volumes Services as Enterprise Class Shared File systems (Azure NetApp Files) are available as well. Fig. 1: Available on Microsoft Azure: Cloud Volumes Ontap and Azure NetApp Files. The foundation for all of this is the data fabric platform and a portfolio of data services which guarantee an end-to-end connection in on-premise and cloud environments. Data management in these environments becomes significantly more transparent and easier. Consequently, digital transformation plans can be executed faster and seamlessly. In general, SAP customers use the cloud services of their public cloud provider or hyperscaler. Most of the time, these include Hana services, operating system services, and data services. All of them are together in one cloud – in AWS, Google Cloud Platform or Microsoft Azure. Furthermore, they provide SLAs or are responsible for them. The trademark of public cloud providers is that they are constantly and quickly developing and optimizing their products, which is generally a good thing. However, no public cloud provider likes to give insights into their products, or technological details. Customers often know nothing about which hypervisors have been optimized, what latency they should expect when, or what the networks in a data center even consist of. Azure NetApp Files is a native, high-performing, and stable Azure service. This means that in Azure, NetApp systems can be operated. Microsoft is doing its part by providing easy-to-use provisioning models and subscription categories. Consequently, it becomes possible to provide NetApp capacities and resources in virtually no time. For billing, there are two options. One, time-based billing including all licensing costs. Two, in the case of Cloud Volumes Ontap, the possibility to purchase the Ontap license from NetApp and to only be billed for the utilization of the cloud service provider’s infrastructure. The same Ontap already in use on-premise is leveraged in cloud solutions as well, but in a specifically optimized format. Consequently, customers get a NFS that is growing and maturing over the years to meet the requirements of SAP environments. Furthermore, they can access Ontap features like SnapShot and Cloning create backups and system clones. Additionally, SAP and NetApp customers can create Snapshot backups directly in Azure or a Restore and Recovery through SAP tools. There is also the possibility of transferring data in object stores to long-term archives, or of creating a NFS for mission critical SAP use, even with large sets of data. The Azure file system can currently be used with data sets of up to 100 TB. SAP Hana Large Instances in the form of Bare Metal systems are also available on Azure. NetApp Bare Metal support is generally possible. Azure Bare Metal sizes for Hana DBs start with 1 TB. SAP customers using NetApp on-premise and wanting to deploy a hybrid cloud approach with the use of NetApp on Azure benefit from homogeneity. They can also use the same or similar management functionalities, for example SAP Lama (SAP Landscape Manager). Fig. 2: The data fabric architecture of NetApp makes data management on-premise and in the public cloud possible. Speaking of homogeneity: If customers opt for a hybrid approach based on NetApp, they cannot only just copy their data, but also transfer and synchronize them safely and efficiently. What if SAP customers have been using data management and storage systems from different providers on their on-premise systems but prefer NetApp on Azure? Not to worry, NetApp has a solution for that as well: NetApp Cloud Snyc, a tried-and-tested transfer solution. 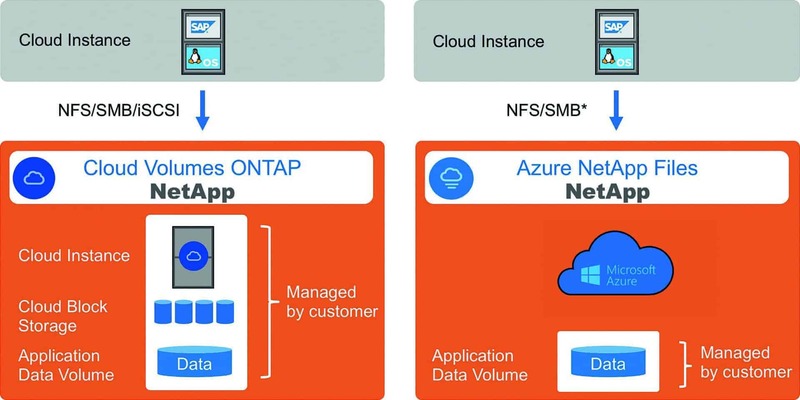 Because of its partnership with SAP, NetApp is able to provide all customers, all operating concepts, and all IT infrastructure landscapes with system solutions like snapshot-based backup, system copies at the touch of a button, and efficient storage replication. This is possible in on-premise landscapes, in private cloud environments with OpenStack, and in hyperscaler public clouds. Integrated hybrid cloud data services make data transparent and easy to access, control, and secure. With NetApp, SAP customers are equipped with the tools they need to tackle the challenge of hybrid cloud computing.